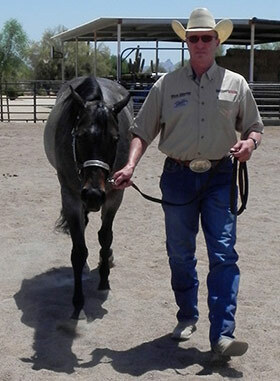 CORRECTLY SHOWING YOUR HORSE AT HALTER - HELPFUL TIPS AND INSIGHTS - Mark Sheridan Quarter Horses, Inc.
After a few months, I’m back in front of the computer writing articles on some interesting topics that I feel will help people who are constantly seeking knowledge about training or showing their horses. Spending a lot of time showing and judging at quite a few shows, I get many ideas for articles from the questions I receive from exhibitors. At the end of long day of judging I like to take time to note the thoughts and ideas I encountered during the day that would be helpful information to competitors to make their chances of winning in the arena easier, fun and simple. As I’ve mentioned in previous articles, when I’m judging I often find myself wanting to give a variety of clinics so I can help everyone who brings a horse to me for evaluation, regardless of the event in which they are showing. Unfortunately that is not an option, as clinics and judging are two separate areas. However, they both require education, and this is where I can hopefully give some positive feedback and give back to the industry that I love so much and has allowed me to make a living teaching horses and people. This article will help people who are showing their horses in Halter competition. The new class of Performance Halter has hit most of the breeds over the last few years. 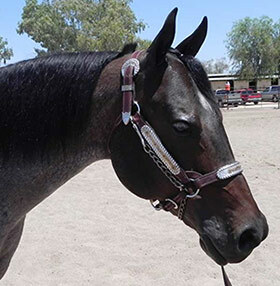 In addition, versatility ranch classes and various competitions require showing your horse at Halter for breed and open shows and there has been a major increase in people exhibiting their horses in Halter and Conformation classes. Most of the tips in this article will help make your experience in Halter more enjoyable and more competitive. Most importantly, it will give you the tools that will make it easier for the judges to place you closer to the top of the class. One thing to keep in mind is that the Halter class is usually in the morning. It is a great way to make a positive first impression with the judge. You want what you show to the judge to say, “Look at me and my horse close up; see that we are the best in the class and you are going to be seeing a lot more of us throughout the day.” This starts with a smile and a confident look. Seeing a person having fun and enjoying what they are doing has a positive effect on other people, and in this case, the judges. Do your best to make a positive and confident impression on the judges and try to get in the arena first if there is not a work order. If there is a work order for the class, make sure that you are ready to go when it is your time to enter the arena. Reading your rule book in detail, and knowing all of the rules is one of the most important things that exhibitors can do to help their chances of success. Every breed association or club will have the rules that will be enforced regarding lip chains, class procedures, and how the class will be judged. There are many rules that change from year to year, and judges are required to keep up on the rules. Class procedures are important, and make sure to always give the ring stewards, and gate people the courtesy that they deserve. Many of the show staff are volunteers or underpaid but provide an invaluable service to the shows; they deserve respect from exhibitors, judges, and everyone involved. 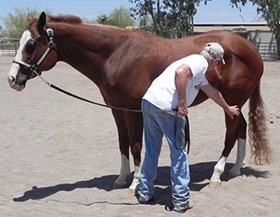 Know your equipment rules, and make certain that your halter and leads are properly adjusted and fitted to your horse. Make sure that your halter is pulled up and fitted so that it is not hanging loose on your horse’s head. I see this at every show that I judge on quite a few horses and it makes me want to walk up and tighten up the halter myself so that the horse’s head looks better. It is fine to have halters on a little loose at home when you get a horse out of the stall to saddle them up, but when showing at halter it is important to snug them up and create that clean look. I also want to note that the chains need to be sturdy chains and not the smaller chains that I often see that look like chains one would use to walk their dog. 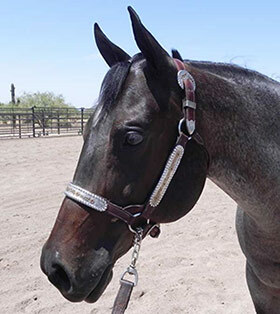 It is not so important that the halter has an abundance of silver, but that it fits well. We are judging your horse, not the halter. Just make sure that your halter is clean, well made, and fits your horse properly. Do your research and find companies or saddle makers that specialize in quality hand made show halters. 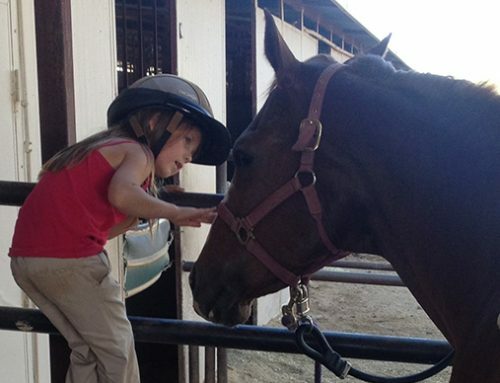 The well- fitted halter on a horse is just as important as how well your hat is shaped. On the class procedures it is extremely important to “WALK YOUR HORSE TO THE JUDGE”. So often, when an exhibitor walks to the judge, the judge has to step to his left to see the horse track because the exhibitor walks straight to the judge putting the horse a few feet to the judge’s left. It is important for the judge to see the horse track at the walk and trot, and if he cannot see them track correctly, he will have to either re-track the horse or move into position to see the horse track. In most of the breed and open shows there will be a cone where the exhibitors should track toward at the trot and then make a left turn, showing the judge the profile view at the trot giving him the opportunity to evaluate the horse’s movement and to detect any unsoundness. If you make a nice sharp turn and continue with your trot to the left and then line up under the direction of the ring steward, it allows the judge to properly assess your horse. This leads to two more important tips, the first one being: make sure that your horse is broke to trot and leads well, and able to make the sharp turns and make it easy for us to judge him. Keep in mind that if a judge cannot adequately view and inspect your horse, he must place them accordingly. It doesn’t matter if it’s a first time weekend horse show or a five-time World Champion halter horse at the World Show; if we can not properly view and judge them, they have to be placed with that in mind. Years ago, halter horses could bounce around, kick out and misbehave and still win, but those days are long gone. It is important to train your Halter Horse just like you would a Performance Horse. Make sure that you set your horse up every day or as often as possible. The best way to do this is to set them up, or square them up, when you take them out of the stall, and again when you are finished working with them before you put them back into the stall or paddock. Horses are creatures of habit, and if you do your homework and practice often, they will square up fast and correctly at the show all the time. 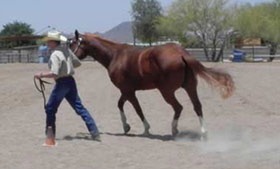 Get your horse broke to set up without handling his feet and legs. It’s fine to help them learn where their legs are supposed to be with your hands when setting up while first teaching them, but work to get them to set up without handling their legs at the show. I have a simple theory when teaching horses to square up; I teach them to start with the outside right hind first, then the hind left, then the front feet last. Remember to adjust their weight accordingly to be able to move their feet. If they are leaning on a leg, they will not be able to move that particular leg. Horses are easy to train, if you just do your homework, be consistent, and spend the time. The second important tip is to make sure that you space your horse with enough room to make it easy for the judge to walk around him. 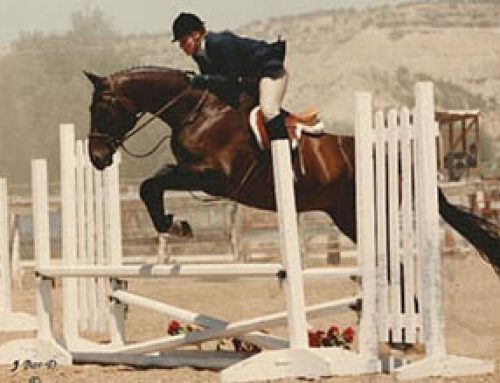 This cuts down on the chance of horses kicking and, more importantly, allows the judge to have enough space to get a good view of your horse from the front and back. Use common sense; in a stallion class, for example, one must obviously give more room between the horses for safety issues. In a smaller arena the ring steward will most likely instruct you where to line up. Always keep in mind: To place your horse we must be able to see your horse. A pet peeve of mine that is relevant to these two tips is to make sure that you do not put your lead behind your back and reach back to set up a leg. This always drives me nuts! We all have our likes and dislikes, but this one is very improper and very unsafe. Moving on to more helpful tips, one of the most important ones is very simple, yet so many people struggle with it: mouthing your horse. If you show a mare or stallion, it is mandatory that you show their teeth or “bite” to the judge. A judge must be able to see where the incisors line up to determine if they are parrot mouth or have any other mouth issues. The proper way to do this is to put one hand on their mouth and separate upper and lower lips to expose the bite. I find it amazing how many people fight their horses with this simple maneuver. 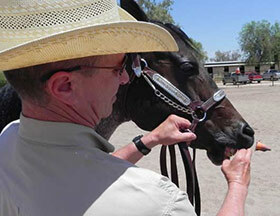 If you just spend a few moments every time you are around your horse, they will allow for you to part their lips and show the teeth. Most of the Halter horse trainers will show you their horse’s teeth upon approaching the horse for inspection and, as a judge, this make our jobs easier so that we don’t have to ask to see their teeth. If more people would watch the really talented Halter trainers show their horses, they could pick up a few pointers just by watching. If you have the opportunity to view the right professionals, watching and observing people who are experts can be as valuable as taking lessons. My next tip is another very constructive and important thought. At most of the shows that I judge, there is always a horse or two that is acting up and rearing, spooking, misbehaving, and/or will not set up or trot. The comment I hear time and time again from the exhibitor is, “This is his first show”. I am very patient in these situations and I try to be helpful, however, if these horses went to a show a few times just for the ride and learned to be around different venues and conditions, they would show so much better the first time they actually competed. I never take a two-year-old pleasure horse or green western riding or trail horse to their first show and actually exhibit them on their first trip away from home. I will haul them around to shows and ride them around, and let the young ones get used to being on the road and different situations and arenas. There is not much difference with the Halter as well. Take them to a roping event, open show, or the neighbor’s arena and tie them to the fence and let them chill. This will go a long way in getting them to relax and show well at their first outing. Exposure for young horses is very important. One of the most important issues that exhibitors must realize, is that if we cannot see their numbers, and if it very difficult for us to find their numbers, it can become a challenge. It is important for exhibitors to always make their numbers easy for the judges to see. When I show in the Halter classes, I put the number on my hip for two reasons: I can always see the judge and they can always see my number at all times. The last thing I want to do is make a judge hunt for my number or send the ring steward out to find my number. The second reason being that I don’t like putting pin holes in a $75 dress shirt! I understand that in the Showmanship class it’s mandatory to put your number on your back, but just make sure that in the Halter class that the judge can find your number with ease. Many times in the Halter classes, the exhibitors will practice their Showmanship skills. This is fine as long as you make sure to let us judge your horse and don’t be bouncing around from side to side and obstructing our view. If your number is on your back and you have a ponytail that blocks the number, this could be an issue for the judge and ring steward when we are trying to find your number. It’s so important for a judge to be able to find the right numbers with ease in order to place the class correctly. Keep an eye on the judges, and be ready to show your horse when they arrive for the inspection. It’s very important to be aware of where the judges are, especially in a multi-judged event. As a judge I can say that we always strive to place the class in the right order and to get the numbers correct all day long; making it easy for us to do so will help you out as well! In wrapping up, please keep in mind that these are my personal opinions and not those of any breed associations. 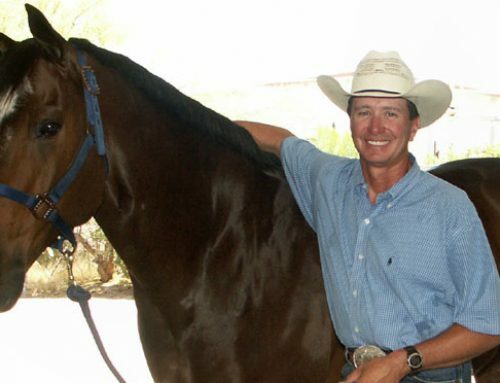 I judge alongside many talented and knowledgeable professional horseman and horsewomen, and feel that these are the most helpful and useful tips that will aid in future success with your horses. 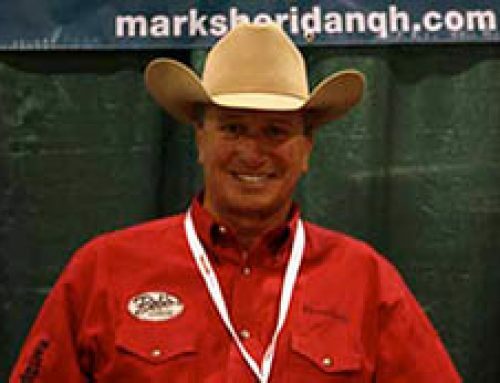 I also suggest contacting the AQHA to find a talented Professional Horseman in your area who can help you with whatever guidance you might need for your horse, regardless of the breed, event, or type of training. Feel free to contact me anytime for thoughts or questions regarding this article or past articles and enjoy riding, teaching, and learning with your horse!